Welcome to Bucolic Bushwick. Here you'll find advice on rooftop vegetable gardening, as well as several plans for DIY self watering planters. Please share this page with others and help spread the vegetable gardening movement. The micro climate on the roof is very desert-like; hot, dry and windy. The vegetable plants go through water much faster than if they were at ground level. I water the containers everyday, but the cherry tomato plant and the eggplants exhaust their water supply before I make it home. By the time I get back from work their 1 gallon reservoirs are empty and their soil almost bone dry. I really, really don't want to water twice a day, so I had think of a way of extending their water supply. I was on the verge of buying one of those plant sitters with the ceramic cones, but I decided to try Mr. Brown Thumb's pop bottle drip irrigation system first. I'm happy to say it's working wonderfully. With them in place I can go a whopping 24 hours without watering! 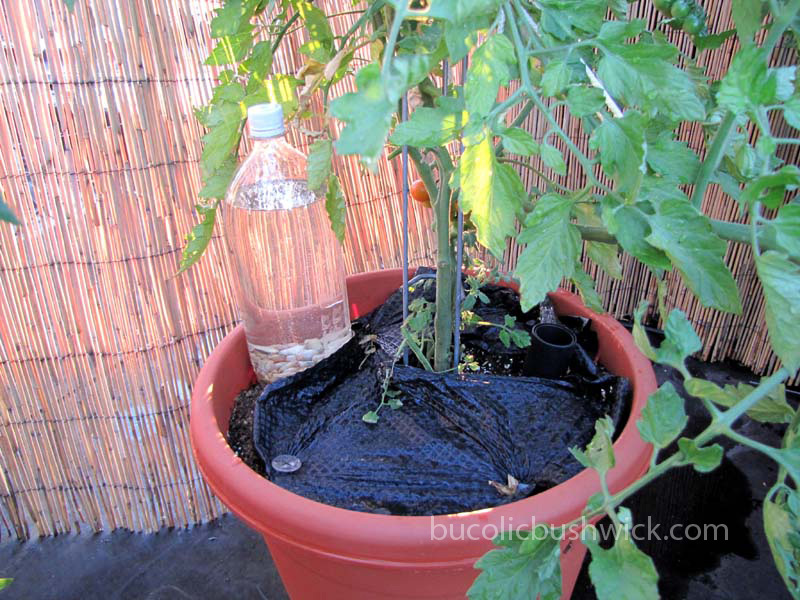 Just poke a few holes in the bottom of the bottle, add some rocks to weigh the bottle down and place it in your planter. To make sure there is good contact between the bottom of the bottle and the soil press the bottle a few inches into the soil. As a bonus I had all the required items on hand so it cost zero dollars. Anyone looking for a low cost, slow release watering system for their container garden can't do better than this, give it a try. I definitely like the idea of not having to water my plants so often, especially in the heat and humidity of July and August. I've seen this idea of using pop bottles before, but I'm really not a fan of plastic. I'm wondering if something like a Klean Kanteen bottle would work the same way, with the added plus of not being made of plastic. I may try it next year. What a wonderful great idea! Thats for sharing this information, it really saves a lot of my sensitive plants especially during a very hot day! Thanks for the link and glad you found the post useful. I have a few hanging planters that dry out so fast I usually end up planting the plants in part of the garden but I really like hanging plants around our doors. The pop bottle dripper sounds like the answer to my problem. Thanks a bunch. And my flowers thank you as well. Are you keeping the top (bottle cap) closed, so that air needs to come through the holes at the bottom? If I allow the bottle cap to be open, the water comes out really fast, even with a very small hole. If I close the bottle cap it does not come out at all. Maybe I need the holes to be in contact with that soil? Or maybe larger holes? If you could give some idea about how large and how many holes that would be great. I am hoping to have the water not drain for a couple of hours but am unable to do so. - Looks like once it has soil contact it works well. I was attempting to make something that dripped into an EB reservoir, but was unsuccessful. Yes, soil contact is a must. Adding a few rocks to the bottom of the bottle and burying it in the soil a few inches helps. Also, I would tweak the bottle for a few days until I figured out the best setup for the situation. Keep the cap fully closed, or leave a little wiggle room, depending on the container you have it in and what plant you're using it with. I use a similar method with an inverted soda bottle with an attachable water cone.